Independence, rapid growth and globalization have turned this Central Asian country into a land of innovation. What we can learn. Kazakhstan is a sprawling, landlocked country in Central Asia. It is the ninth largest country in the world and has significant economic power in the Commonwealth of Independent states, in no small part because of a thriving oil and gas industry. Once part of the Soviet Union, it is bordered by Russia and China, as well as Turkmenistan, Kyrgyzstan and Uzbekistan. Over the last 25 years of independence, Kazakhstan has gone through massive changes — changes in political regimes, rapid economic growth and globalization. Among other Central Asian and some other CIS countries, Kazakhstan has the most open policies for information, trade and business. Looking 10 years out, the future of Kazakhstan will be shaped by its unique culture and character. 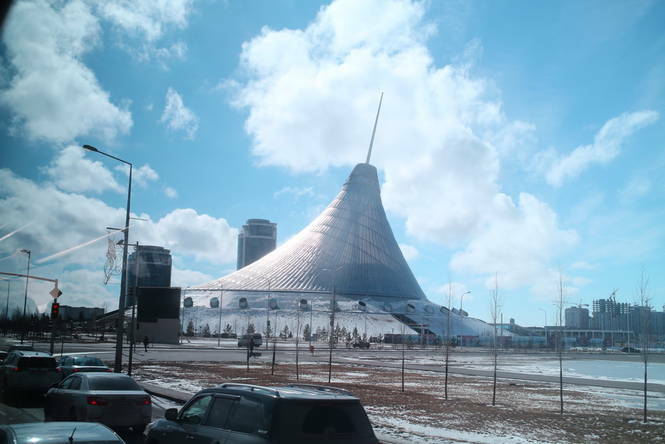 Looking at early signals based on Diana Tsoy’s work studying the Kazakh entrepreneurship ecosystem, we can get a glimpse of what Kazakhstan will look like in the next decade. In Kazakhstan, there is generally a culture of privacy. This is in part because failure reflects not only on an individual, but on their family as well. This causes people to be more risk averse, even in their communication, whenever it is tied to their identity. Kazakhstan’s GDP was $184b USD in 2015. Because of this, anonymous online forums are popular. One very popular social network is Kelin (Kazakh for daughter-in-law), an anonymous network for women. On Kelin, Kazakh women can exchange information, learn the rules of communication in the family, raise questions and receive many answers in a safe environment. There is also, generally, a strong connection with family for people in Kazakhstan. Within Kazakh culture parents and children have very tight connections. Children tend to be less independent than in the western world, including close parental oversight of schoolwork. This close relationship led to development of several IT platforms and mobile applications, through which parents can monitor not only the grades at school and home assignments, but also the time a child starts their lesson, when they have left school and even their location through GPS. The platforms can identify abnormal behavior and send alerts in case of emergency. Examples include special mobile applications like E-oku.kz and Mongoose.kz. This close relationship continues as children reach adulthood. According to Kazakh tradition, the youngest son in the family should take care of the parents and live with them in the same house for their entire life. Nowadays, this tradition is often kept, and many old people live with their children. These cultural specifics will continue to influence online communication tools in the future. In Kazakhstan, doing favors for strangers is commonplace. For instance, on Facebook in Kazakhstan, it is not uncommon to see people posting about someone they have met that needs help, whether with a phone number or bank account number for donations. Although this might look like a scam to Americans, to many Kazakhs it’s a way to provide or access social support. As an example, there’s a well-known case in Kazakhstan of a 2-year-old girl, Zere, who needs a unique surgery. The surgery is very expensive — USD $164,600 — and requires transport to California. Her parents have been leading a donation campaign on social media for a year now. The campaign is transparent, and they have now collected USD $140,958. Other examples that might pop up in the timeline of Kazakhstan social networks include requests to help single mothers, disabled people or old people who can not fully provide for themselves. Photos of found documents or animals are also posted on social media, in case someone knows the owner. Based on this ethos of openness and sharing, the website provides tools to donate money peer-to-peer, or post lost items, providing an internet platform specifically built to facilitate these kinds of exchanges. Because of this, many people are more comfortable using the English word “businessman,” which sounds the same both in Russian and Kazakh language, and lacks the negative connotation. However, this attitude is changing, as evidenced by the many local and international startup incubators popping up. China is investing billions of dollars in the Kazakh economy, with promises of an increase over the next few years as part of their “Silk Road Economic Belt” effort. This will buoy efforts far beyond natural resources, as regional commerce expands through improved infrastructure and partnerships. For the last 15 years, Kazakhs were mostly consuming imported goods and services. They have experienced all benefits of the globalized world. Nowadays, local small and medium businesses are making their first steps at a thriving domestic economy, often run by the professionals who either worked within global companies or studied abroad. They are applying this experience abroad and adjusting it to the local culture to create new innovations. These trends won’t let us predict the future, but we can intentionally shape our story of the future. It also provides us a better shot at creating a global future that we want. This article first appeared in Institute for the Future and was republished with permission.